Home security cameras don’t just add an important layer to your home security system by giving you an extra set of eyes inside and outside your home. They can also deter break-ins, capture and store important event footage, and offer a little more comfort when you leave the kids and pets back at home. Dimensions: 4.9 x 2.9 x 2.9 in. The Nest Cam IQ Indoor comes loaded with a powerful camera, a high-quality speaker, and a sophisticated microphone that suppresses ambient noise while you’re listening in on things at home. Person alerts help separate relevant notifications from things like passing cars or branches blowing in the wind outside your windows. It also tracks any motion it catches and zooms in for a clearer view, making it an ideal choice for parents or pet owners who want to keep an eye on things while away. The Nest Cam IQ Indoor also comes with a built-in Google Assistant that helps you manage the camera, access footage, and get answers to your questions. The voice assistant is a unique feature that sets this camera apart from other indoor cameras, and we really like that you can manage the camera with your voice instead of digging through an app. 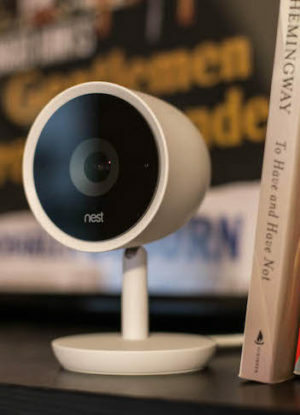 ASecureLife’s recommendation: The Nest Cam IQ Indoor is the best security camera for parents and pet owners who want to make use of the camera’s zoom tracking feature and its high-quality microphone and built-in speaker. Learn more in our Nest camera review. >>Convinced? Buy the Nest Cam IQ Indoor today. Dimensions: 3.1 x 2.9 x 2.9 in. 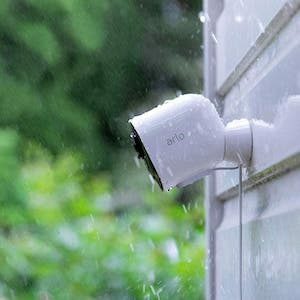 With its water-resistant exterior, the Arlo Pro 2 excels as an outdoor security camera. The camera’s wireless design allows you to place it anywhere on your property within range of your Wi-Fi network. 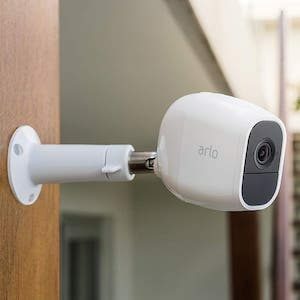 The wireless design also allows you to connect multiple Arlo cameras together to give you a more complete view of your property, all within the same Arlo app. The app also lets you set zones to limit unnecessary motion detection notifications, like when your neighbor takes their dog past the house twice a day. 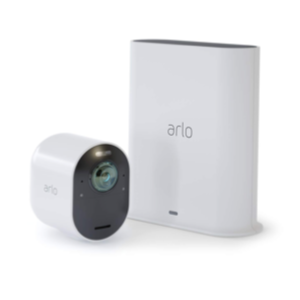 Read our full Arlo review to learn more. ASecureLife’s recommendation: We like the Arlo Pro 2 outdoor camera for its high-resolution image recording. Its wireless design lets you set it up anywhere within your Wi-Fi network, which makes it a great choice if you want to monitor an outdoor area that’s not near a plug. >>Want an excellent outdoor camera at a reasonable price? Buy the Arlo Pro 2. Dimensions: 2.8 x 1.2 x 2.8 in. Our favorite Blink Camera comes with a whole lot of placement options thanks to its wireless and weatherproof design. These wireless security cameras work both indoors and outdoors, and they come with an impressive two-year battery life and free cloud storage. 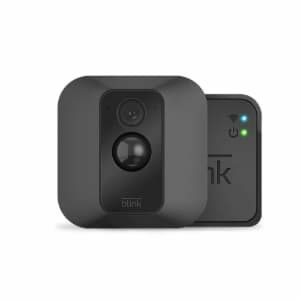 If you need more than a traditional Wi-Fi camera, you can connect your Blink XT via a 4G cellular connection. That makes the Blink a great option if you don’t have consistent Wi-Fi coverage throughout the house, or if you want to set up the camera outside of Wi-Fi range, like your garage. 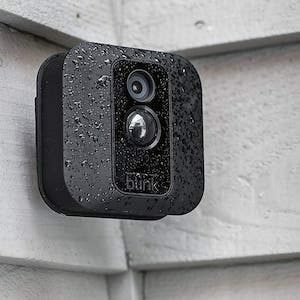 Blink XT cameras require a hub, but the hub allows you to connect up to 10 security cameras in one system—so you can monitor them in one spot. ASecureLife’s recommendation: The Blink XT gives you plenty of flexibility with its wireless, weatherproof design. And you don’t have to pay for a plan to get access to cloud storage. >>Like the versatility of the wireless and 4G-capable Blink XT? Buy it today. Dimensions: 3.4 x 2.8 in. Night vision: Up to 15 ft. The Logitech Circle 2 offers an impressively wide 180º field of view, high-definition 1080p video, and 24 hours of free cloud storage. It also has two-way audio so you can communicate with your kids or pets back home. For the price, this camera comes with all the features and security you need in a camera without sacrificing quality. The Logitech Circle 2 isn’t the cheapest security camera we’ve come across, but it offers the best balance of affordability, reliability, and security––since cheaper security cameras can be hacked. Plus, you can use it inside or outside the house. 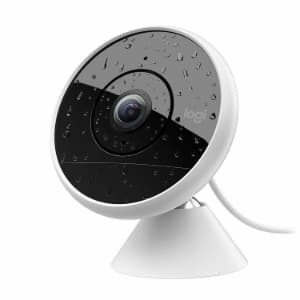 ASecureLife’s recommendation: We recommend the Logitech Circle 2 to anyone looking for a cheaper security camera that still gives you a great set of base features like 1080p video, 24 hours of cloud storage, and two-way communication. We think it’s the best security camera you can buy on a budget without having to worry about quality or security issues (like the camera being hacked). >>Found the affordable camera you’ve been looking for? Buy the Logitech Circle 2. 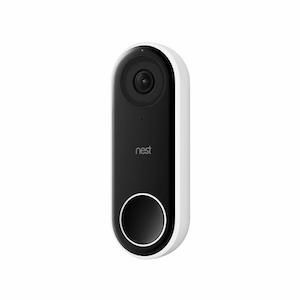 The Nest Hello is our favorite video doorbell camera because it gives you sharp video footage with a ton of useful features like two-way communication, powerful night vision, and a unique facial recognition software that remembers familiar faces, so you’ll know who’s at your door without having to be there. In our testing we found that the Nest Hello looks better, sounds better, and functions more reliably (no Wi-Fi connection issues or fuzzy video) than competing Ring doorbell cameras. ASecureLife’s recommendation: We like the Nest Hello for its powerful camera and app that includes useful features like zone setting and facial recognition. Learn more about the Nest Hello. >>Want the best video doorbell on the market? Buy the Nest Hello. The Arlo Ultra gives you 4K video footage with a 180º field of view, which makes for some of the highest-quality video and one of the widest fields of view on the market. Its color night vision gives you clear video in the dark without washing out images like we’ve seen from lower-quality night vision cameras. The Arlo Ultra recognizes the difference between people, packages, and pets, and it notifies you accordingly so you don’t have to check your phone just to see the same motion alert multiple times a day. All that said, this awesome camera comes at a high price of $399.99, so you’re really paying for it if you want one of the most cutting-edge security cameras on the market. ASecureLife’s recommendation: We recommend the Arlo Ultra to anyone who wants the best and isn’t afraid to pay for it. You’ll benefit from a high-quality security camera with smart features like automatic zoom, intelligent tracking, and smarter notifications. >>For ultra-sharp security camera video, buy the Arlo Ultra HD. The Amcrest UltraHD PTZ gives you a super crisp HD resolution and an expansive viewing angle. But what sets it apart is its PTZ (pan, tilt, and zoom) capabilities. The Amcrest gives you 360º pan, 90º tilt, and up to 16x digital zoom. That gives you a view of pretty much everything in the room as opposed to just a stationary feed based on where you place the camera. You also have the choice between cloud storage through the Amcrest app or local video storage through a micro SD card. ASecureLife’s recommendation: We really like the Amcrest’s high-resolution camera and its pan, tilt, and zoom functions that give you a much broader range of view than most cameras. That versatility is useful if you want to pay for only one camera that covers the field of view you’d get from multiple cameras. 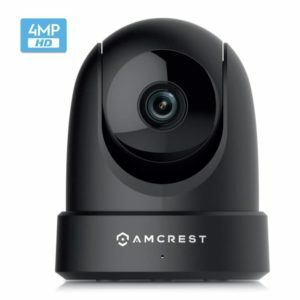 >>Buy the Amcrest UltraHD PTZ. Dimensions: 8.9 x 4.7 in. No one wants to leave the furry ones at home, but if you don’t have a pet-friendly office, you might not have a choice. The Furbo gives you a window into your pets’ lives at home while you’re not there. 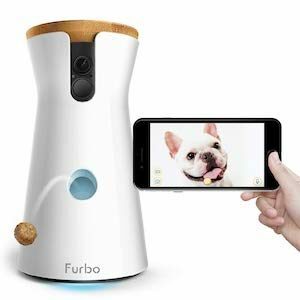 The Furbo notifies you when your dog barks, which quickly alerts you if your pet is in distress or if there’s a more serious emergency at home. It also gives you the ability to talk to them and dispense treats, which is sure to make your time apart more bearable for both parties. How sweet is that? The Furbo gives you a window into your pets’ lives at home while you’re not there. ASecureLife’s recommendation: We recommend Furbo to pet owners who have to leave their furry ones home during the day. Two-way chat and a treat dispenser make time away easier for both parties. >>>Ready to shoot treats at your dog from work? Buy the Furbo. Resolution: Resolution determines the quality of a security camera’s video. Not all cameras with 1080p resolution will look the same, but for high-quality HD footage you should look for something with at least 720p resolution. Field of view (FOV): Resolution determines the footage quality, and field of view determines the observable field of your camera lens. Wider FOVs help you see more at once, which can reduce the number of cameras you need. But wider isn’t necessarily better. Security cameras with fields of view around 180º and wider can look distorted. The FOV sweet spot is around 160º, which gives you a plenty large viewing area without sacrificing quality. Two-way voice: Families with kids or even pet owners might benefit from two-way audio. This allows you and whoever’s at home to communicate with each other if you see something urgent happening. 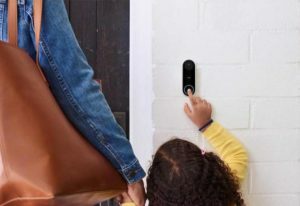 Two-way chat is also useful on doorbell cameras like the Nest Hello so you can communicate with people at your door and give the impression that you’re home. Power source: This is an important consideration if you’re looking for a camera you can set up anywhere in or outside of your home. If you’re serious about home security, we recommend adding security cameras to the equation. They give you eyes on your home while you’re not there, notify you of goings-on, and store important video events that you don’t catch in the moment.